A superbly finished first floor apartment within this modern and conveniently located Berkeley Homes development. The space has a stylish and modern feel with wonderful light and access from the open plan kitchen / reception space to a balcony.. There is also a secure underground parking space. Bromyard House is located at the corner of Uxbridge Road and Bromyard Avenue and the apartment and parking are accessed via portered gated security. The block is just opposite the large Virgin Active health club and a few minutes walk from both Wendell and Acton Park and good local schools. A Tesco Metro is handily located nearby and further local shops on Askew Road are also convenient, and the shopping and transport hubs of Hammersmith and Westfield are within easy reach. The 607 bus route east along Uxbridge Road provides the fastest access to the Shepherd's Bush Central Line tube and Acton Central overland station and East Acton tube (Central Line) are within walking distance. 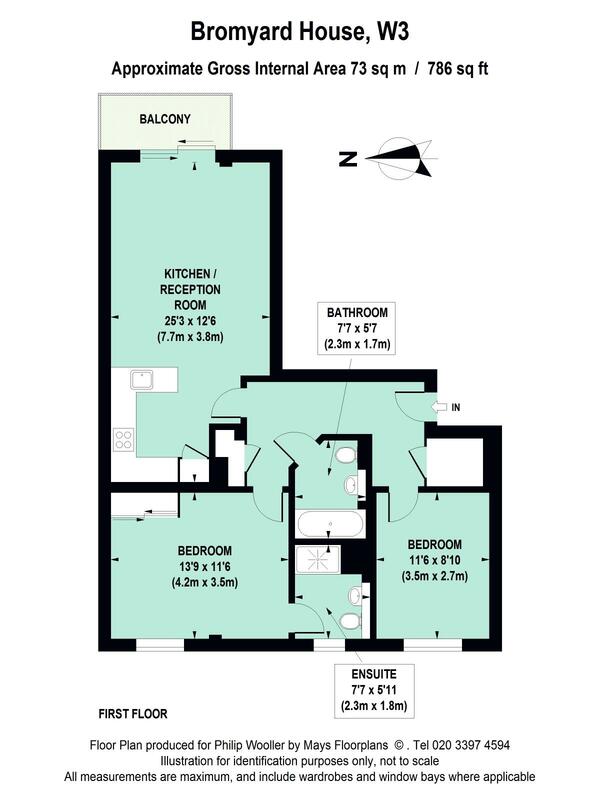 786 sq ft / 73 sq m approx.